Whilst it's not as good as the original, The Rescuers Down Under is not a disgrace as far as sequels go. Many theatrical sequels tend to be no better than ones released direct-to-video. Down Under is an exception. Plot-wise, there are a few faults. Some scenes just seemed to be there for the sake of it and the plot is considerably weaker than the original. But there are enough jokes and enough suspense to keep the film going so there's never a dull moment. Some might say that the story is a rehash of the original and that is partly true. That's the only real major flaw I find in Down Under. Benard and Bianca stay wonderfully in character and the new characters, such as Jake the Kangaroo Rat are very memorable too. Penny may have had Teddy for a friend but Cody has Marahute - a mighty Golden Eagle. Her movements are true to that of a real bird of prey, and yet she has a distinct humanoid quality. Whenever you look into her eyes, you know exactly what she's thinking. Jim Jordan (the voice of Orville) is sadly dead. (God rest his soul). 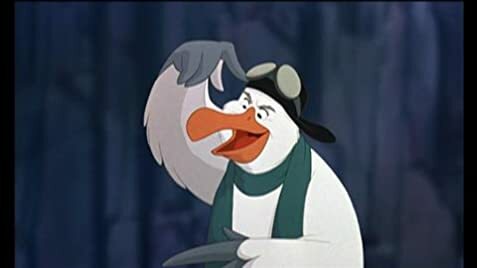 But instead of replacing the voice actor, we have a new albatross - Orville's brother Wilbur. He is a worthy replacement. He provides plenty of comic relief, especially during his nightmarish time in hospital. Joanna the villain's sidekick is like Madame Medusa as a lizard. She looks like she came straight out of the original. McLeach, the evil poacher is a very intimidating villain. He's not as funny as Madame Medusa but he's not meant to be. He's not the sort of person you'd like to run into in the wilderness. If there's one aspect of this film that's superior to the first, it's the animation. The computer generated shots are spectacular. Sure, they might be dated today, but I think that the hand-drawn animation melds nicely with the CGI. Whilst the jungle in Tarzan looked like plastic, the rocks and cliffs in The Rescuers Down Under look realistic and full of texture. We have a lot of 'high-flying in the clouds' scenes which are a lot of fun and would be brilliant on the IMAX screen. Also, putting a tiny mouse against a vast landscape gives the movie an epic feel. Like the first Rescuers, the backgrounds are beautiful and pave the way for the beautiful scenery seen in The Lion King. However, Down Under does have its little flaws. One example is that Cody is Australian yet he speaks with an American accent. Also, how on earth did he climb up that huge cliff? There are other little inconsistencies too but they are easily overlooked. The sequel connects nicely with the original. A lot of the RAS mice from the original are seen again. Also, a lot of character designs are true to the first as well. Benard has hardly changed at all. Only Bianca looks somewhat different. In conclusion, The Rescuers Down Under is inferior to the original Rescuers, but it's still high-flying fun. This is definitely one of the better Disney sequels. So sit back and enjoy. Remember, you *could* be watching Pocahontas II. Originally Wilbur's calendar was to have a picture of Bart Simpson from The Simpsons (1989); this can be seen in the original animatic. When Jake and Sparky are playing checkers, the positions and colors of the checkers changes right before Sparky makes his winning move. In the French version of the movie (which was made in 1991), the beautiful Anne Meson-Poliakoff's Pop song "Bernard Et Bianca Au Pays Des Kangourous" can be heard during the ending credits with Patrice Tison on lead guitar, Bernard Paganotti on bass, Jean-Jacques Milteau on harmonica, Alex Perdigon, Kako Bessot and Patrick Bourgoin on brass ensemble and Charly Doll on drums & percussions. However she and the other musicians appear to be uncredited.